As the number of touches on each shipment increases, complexity increases along with it. As a result, the level of visibility required to transport goods from place to place in a timely and efficient manner continues to increase. To cope, many shippers and freight forwarders are working towards increasing digitization and connectivity across their value chains—effectively paving the way for the Logistics 4.0 era. As these processes continue, businesses should expect Logistics 4.0 to be a vital disruptive force within the world of supply chain management. We already alluded above to the fact that customer delivery expectations are changing. Not only do consumers expect on-time deliveries to be made on a rapid timescale, they expect deliveries to be made in a highly visible manner, with live tracking, delivery alerts, and all manner of other information made available to them. As it happens, these are precisely the elements that make up Logistics 4.0 systems. Like Industry 4.0, Logistics 4.0 is built on technological connectivity across the supply chain, with IoT devices, RFID chips, and smarter scheduling solutions all combining to create leaner and more efficient processes that would be virtually impossible to optimize by hand. As part of this overall paradigm shift, shippers and freight forwarders are striving for meaningful increases in end-to-end visibility—the better to collect and leverage data in an agile way. And thus do we arrive at one of the first disruptions that Logistics 4.0 will cause: the visibility revolution. The more end-to-end visibility becomes a requirement for meeting customer expectations and operating Logistics 4.0 systems, the more it will be seen not as a luxury or a value-added proposition, but as a necessity. Other businesses will be disinclined to partner with those who can’t provide a high degree of visibility (since it will hamper their own efforts in the analytics and real-time tracking departments), just as customers will be less likely to purchase from them (owing to the perception that on time delivery will be less likely). What was once a competitive advantage will quickly become a competitive necessity. Though we laid out two of the most significant forces that are driving a push towards increased visibility, there is another element at play here. Again because of the Amazon Effect, the logistics world finds itself almost constantly reinventing the last mile. Shipment allocation and routing are being done on the last leg of deliveries in ways that have never been seen before, and most of this innovation would be impossible without the intervention of Logistics 4.0 technologies. Imagine, for instance, that you’re trying to get a shipment of goods to its final destination; you might have a static transport plan that includes the last mile, meaning that the final leg of your shipments journey is susceptible to potential disruptions. 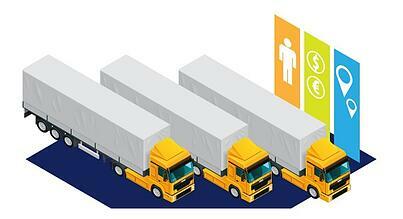 In a Logistics 4.0 environment, you can plan for the last mile on the fly. Your planning software helps you to visualize an entire network of trucks, hubs, pallets, docks, etc. (your own and third party) in real time, and to allocate your deliveries based on analytically-derived insights into the most efficient way to complete your shipment’s journey. You might find that the truck in which your goods currently reside is stuck in traffic near a convenient unloading point where a van designed for last-mile conveyance has some available capacity and is scheduled to depart relatively soon. Or, you might receive a late rush order and use your expansive view of available shipping capacity to fulfill the order in a dynamic, value-additive way. In each of these hypotheticals, planners need access to live information from numerous touchpoints along the value chain—but that access is quickly transformed into value in the form of smarter, more efficient approaches to the last mile. New technologies like AI and machine learning are a disruptive force in numerous industries right now, and logistics is no different. In fact, these technologies represent a crucial part of the Logistics 4.0 equation, powering improved forecasts and smarter supply chain management overall. Thus, as Logistics 4.0 becomes more and more of a daily reality, these technologies will have more and more of an impact on the way the global supply chain is administered. Because the modern supply chain is defined by increasingly complex, globalized processes (the sheer proliferation of usable trade routes in the past few years is staggering), this disruption couldn’t come at a better time. The complexities of a supply chain that is increasingly global are, realistically, too much for a human planner to fully grasp and cope with efficiently. AI, on the other hand, once embedded in the supply chain, can give planners the tools they need to grapple with huge influxes of data and vast global complexities. Does this really count as a disruption per se? Yes, it does, because the introduction of Logistics 4.0 technology into the business of moving goods from place to place will have the startling effect of turning complexity into a strength, rather than a potential hurdle. With new requirements will come new tools and new capabilities that will change the shipping and freight forwarding landscape for many years to come.